The formula is simple and exists in towns and cities the world over. In Tuscaloosa Alabama it’s called a meat and three, in Istanbul, Turkey it’s called lokanta, in Budapest, Hungary it’s an etkezde. Put plainly, it’s a restaurant where the tradesmen (and people who like to eat like tradesmen) go to refuel at lunchtime. They want their food cheap, and they want it to taste like their mom dashed into the restaurant’s kitchen to prepare her son a nice meal before returning to her normal duties at home. 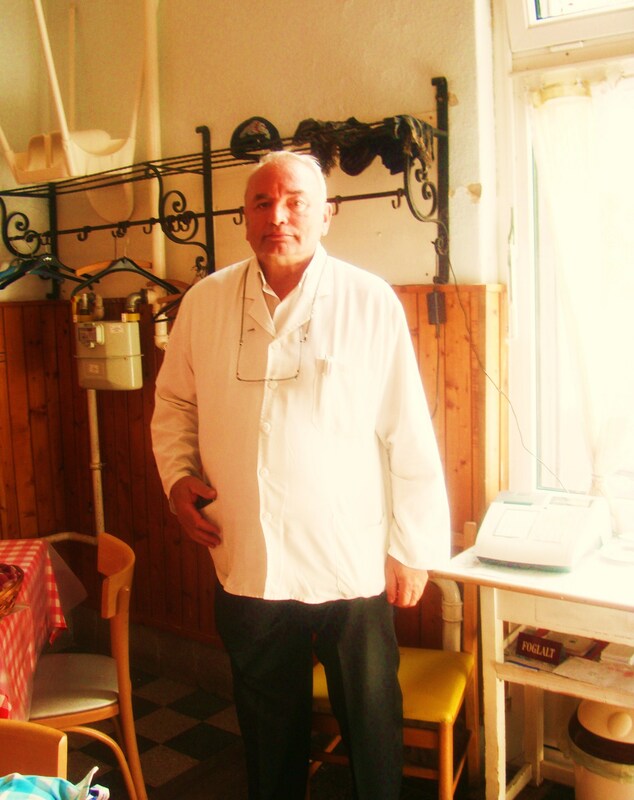 Walking into the warmly-lighted dining room of Kadar, I’m greeted by a man in a white lab jacket, and shepherded to my table by a waiter wearing the traditional blacks and whites that servers the world over seem to favor. I whip out my Hungarian/English cheat sheet and start cross referencing the menu to its English corollary. My waiter takes amusement at my labor and offers to translate for me. He doesn’t get far. Once he says Cold Cherry Soup (Hideg Meggyleves Czeszeben) Tomato Salad with Onion (Paradicsomsolata) and Beef Simmered with Dumplings (Kadash Marha Zsemlegomboccal) I figure I’m set. The honor system is in place at Kadar regarding beverages. A big seltzer bottle like the gag comedy acts of the 1930’s used, sits on the table. If you’re thirsty, just pour yourself a glass (or spray it all over yourself and the table like I did) and notate it for the house. A loaf of bread also sits on the table. I’m aware of the Hungarians not being noted for their bread production so I neglect sampling it. My introduction to the Hungarian classic cold cherry soup is a sweet one. I have a deep love of sour cream, and used to beg my dad to park his tractor close enough to my grandmother’s cherry tree so I could climb up in the lift bucket, and gorge myself senseless. Since these are the two prime components of the soup, it’s no wonder that I drain my bowl in moments. It’s always a roll of the dice when you order tomatoes in a restaurant. I’m not sure when tomatoes are at their peak in Budapest, but this is certainly not the time. They’re a bit mealy. Covered with finely diced white onion, they offer little in the way of flavor. I fare substantially better with my main, a toothsome plate of beef braised in an onion-y yellow gravy. The accompanying-two giant dumplings smothered in sour cream-are good, but needed a bit more time on the stove as the centers are not fully cooked. My bar for dumplings is insanely high as I come from a region of the US where dumpling production is writ into the genetic code. These will not have the good ladies of the Cumberland Highlands region of Kentucky taking notes in their weathered cookbooks. I stop on my way out the restaurant to chat a bit with my host. He’s an affable gent, well-versed in English and interested in conversing with a traveler from a far-off land. We pass the time for a few minutes before he sends me along my way with an “I’ll see you tomorrow at the same time”. This entry was posted in Budapest, FOOD, The Foodist and tagged buda, budapest, cafe, etkezde, hungary, pest. Bookmark the permalink.